Avira PersonalEdition Classic constantly and rapidly scans your computer for malicious programs (such as viruses, Trojans, backdoor programs, hoaxes, worms, dialers etc. ), monitoring every action executed by the user or by the operating system and being able to react promptly when a malicious program is detected. Actions include repair, delete, block, rename and quarantine programs or files. Avira PersonalEdition Classic also features enhanced protection against unknown boot-sector viruses, issuing alerts for boot sectors suspicious formats. Through the permanent update of the detection engine, the protection is ensured constantly: the user can set the product to download any updates when available, thus keeping you clean and safe. 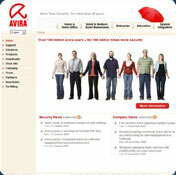 Download the Virus Definition File to always keep Avira AntiVir up-to-date. · Download the latest virus definition file (IVDF) on a PC with internet access. · Copy the downloaded file to a portable media storage such as an USB Stick or a CD-ROM for transferring it to the PC without internet access. Note: Extracting of the ZIP file is not necessary. · Insert the media storage into the PC without internet access. · Start AntiVir Personal Edition Classic / Premium and go the menu „Update" and select „Manual Update". · Select the downloaded IVDF file from your media storage and click „open".Your AntiVir PersonalEdition Classic / Premium is now up to date. Important note: Please keep in mind that an effective protection against new threats is only possible with an up to date virus definition file. Update your AntiVir PersonalEdition Classic / Premium at least every second day. You cannot download any crack or serial number for Avira Antivir Virus Definition File Update on this page. Every software that you are able to download on our site is legal. There is no crack, serial number, hack or activation key for Avira Antivir Virus Definition File Update present here. Our collection also doesn't contain any keygens, because keygen programs are being used in illegal ways which we do not support. All software that you can find here is freely downloadable and legal. Avira Antivir Virus Definition File Update installation package is prepared to be downloaded from our fast download servers. It is checked for possible viruses and is proven to be 100% clean and safe. Various leading antiviruses have been used to test Avira Antivir Virus Definition File Update, if it contains any viruses. No infections have been found and downloading Avira Antivir Virus Definition File Update is completelly problem free because of that reason. Our experts on malware detection tested Avira Antivir Virus Definition File Update with various spyware and malware detection programs, including fyxm.net custom malware and spyware detection, and absolutelly no malware or spyware was found in Avira Antivir Virus Definition File Update. All software that you can find on our servers, including Avira Antivir Virus Definition File Update, is either freeware, shareware or open-source, some of the software packages are demo, trial or patch versions and if possible (public domain licence), we also host official full versions of software. Because we want to be one of the fastest download sites on the web, we host all the software including Avira Antivir Virus Definition File Update on our servers. You cannot find here any torrents or download links that would lead you to dangerous sites. Rate Avira Antivir Virus Definition File Update June 10, 2009!